The last few days I've spend working on user groups. Before, there was the standard admin/mod/user with their privileges hard-coded. Now, I can create new groups, edit their permissions, etc. However, this meant I had to scan each page and update the code so it works. There's likely to be some errors around the place, so please report them if you find any. youreliteness.thengamer.com/forum/groups.png - zOMG admin screenshot! The top table is the groups I have at the moment. 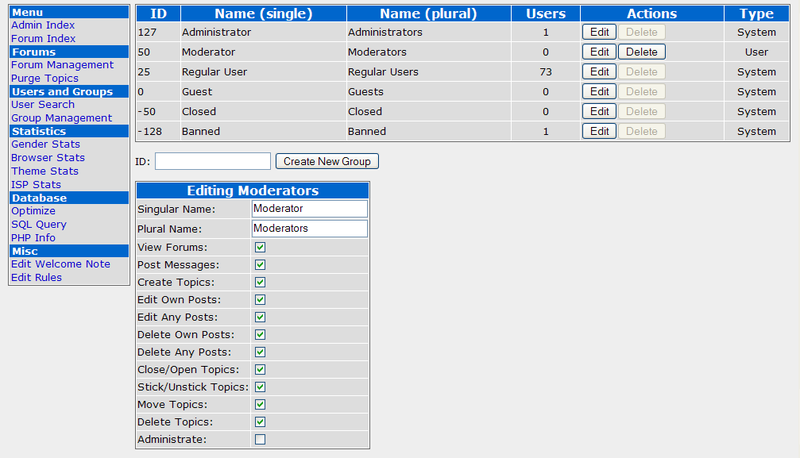 The bottom table shows the permissions for moderators. I can change them as I see fit. I'd like to start making some people mods, but I honestly don't think we have the userbase yet. Our forum has around 10 constantly active users, which isn't really enough. When I feel we need more supervision on the forums, I'll probably make a group called "New Moderators" and give them restricted abilities (editing/deleting any posts... that's about it). After I weed out any possibly trouble makers from that lot, I'll upgrade the rest to full Moderators. Wow, that's one hell of a nice interface. Damn. No spoiling Harry Potter! I will kill people for that! Once upon a time everything was lovely, but that was before I had to deal with people.